Help us this #GivingTuesday, November 27, 2018 reach our goal of $5,000 to provide Music Therapy & Wellness programs to seniors in our Senior Outreach Program and seniors receiving Skilled Nursing services. Your donation gives up to 30 seniors supportive music therapy and wellness program for one hour each week for an entire year. 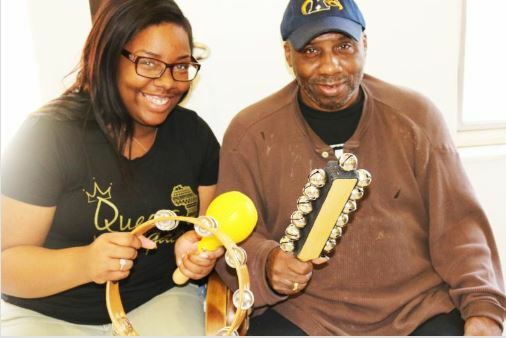 Music therapy and wellness at Eliza Bryant Village gives so much to our seniors – power, transformation, memory, wellness, happiness, peace and love. 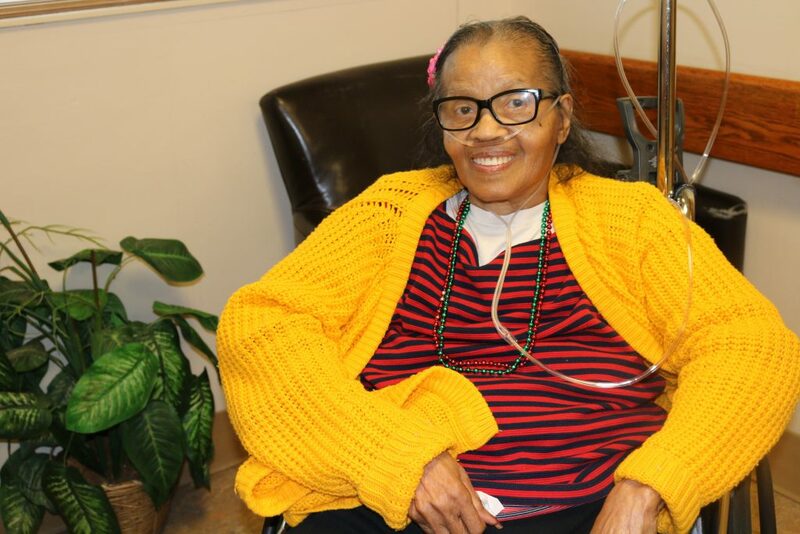 Ms.M, a three year resident of Eliza Bryant Village, is many things: the youngest of ten siblings, a survivor of two strokes and lifelong lover of all things music. She studied as a music minor for two years in college in Tennessee where she was a member of glee club with her older brother. The club traveled often and she was able to travel to almost every state in the country. “I’ve always listened to music,” she said. “I love to sing – I may not be able to sing the best, but I was good enough to be in the glee club.”All of her aunts were teachers – music teachers. She was surrounded by music throughout her life. So, when she suffered her first stroke nearly 30 years ago, followed by a second stroke, it was her faith in God and in music that helped her recover. “Music makes the world go round,” she said. Thanks to a grant from the Ohio Attorney General’s Office, our skilled nursing residents and adult day and senior outreach program participants who have suffered from trauma, violence, or crime during the course of their lifetime are able to access expanded therapy and support programs, including music, art and massage therapy and other enrichment activities such as pet visits, to help navigate the path to recovery. These programs enhance the quality of life for seniors by creating opportunities for social interaction that reduce isolation, improve relationship building skills between seniors and staff, increase emotional awareness with educational tools and reduce stress by providing enjoyable activities offered from trained professionals. The Harry K. and Emma R. Fox Charitable Foundation, Cyrus Eaton Foundation and United Black Fund also support our music therapy programming. Alison Brady, MT-BC, NMT, Clinical Music Therapist at The Music Settlement, said on September 11, 2018, that she “had an amazing session today where we verbally processed through traumatic events, like September 11, 2001, then the group broke out in song to support a group member when they shared their traumatic event.” She added the group spontaneously started singing I’ll Fly Away and staff accompanied on guitar and harmonica and everyone sang with each other. John Pearson provides music wellness through one on one visits with our seniors. He visits the Village three times a week to sing, play guitar and spend time with individuals who prefer not to leave their rooms to enjoy the music. He says he feels the connection is strengthened with this facetime relationship that helps encourage more talking and he is able to tailor music preferences in this more intimate setting. After a music wellness session, John notices that participants are more relaxed and overall have a more attitude because of the social interaction. Please support our #GivingTuesday campaign by giving a generous donation on November 27, 2018, to help us reach our goal of $5,000. Although #GivingTuesday is officially November 27, 2018 all gifts received until December 31, 2018, through our #GivingTuesday crowdfunding page will support the music therapy and wellness programs. We have two days for getting deals – Black Friday and Cyber Monday. On #GivingTuesday, we have a day for giving back. Together, people are creating a new ritual for our annual calendar. #GivingTuesday is the opening day of the giving season. Everyone has something to give! Was your 2017 campaign successful? 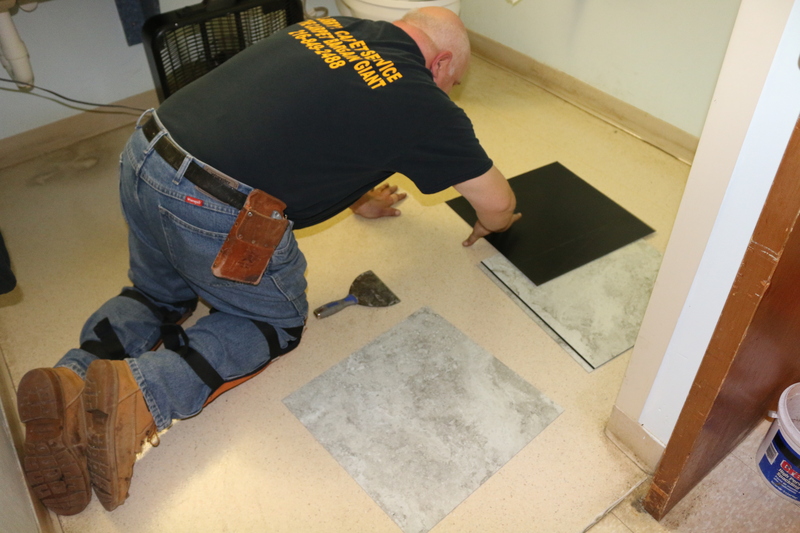 Our 2017 inaugural #GivingTuesday campaign raised money to support the renovation of 50 bathroom floors for our skilled nursing residents. Thank you to our supporters including a generous donation from Eliza Bryant Village Auxiliary II ($4,500), a grant from The Higley Fund of the Cleveland Foundation (25,000) and nearly 35 individuals donations via our online donation platform –CrowdRise- and checks mailed from donors and Board Members ($4,605). Check out our 2017 Giving Tuesday YouTube videos by clicking here. Music therapy and wellness give power to older adults – the power to communicate and navigate new avenues of expression. 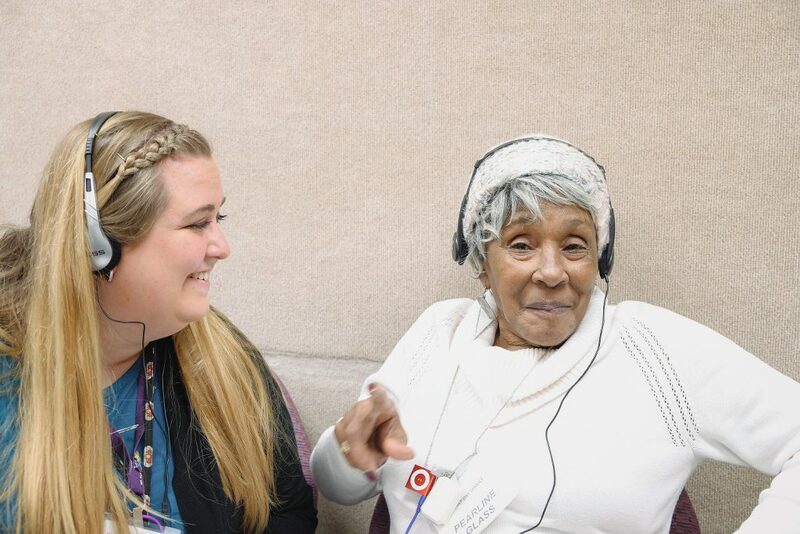 The Eliza Bryant Village Music & Memory program – an individualized music listening program – gives participants power to their music of choice. The Music & Memory program, an individualized music listening program, gives participants the power to enjoy THEIR music. At the Village, the Music Therapist follows a clinical approach to determine what songs a senior enjoys. The participant communicates preferences to the Music Therapist through verbal communication and non-verbal communication, including body gestures, dance moves, facial expressions, and more. Each individualized playlist is customized to each participant; therefore, the playlist is unique to that one person. 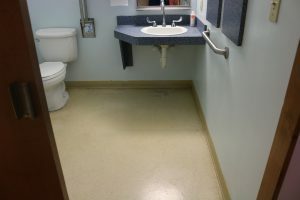 Playlists are then used to help during difficult, stressful or challenging times of day, like during medical procedures such as dialysis, for example. The music they hear is music they selected – they had POWER in choosing what they wanted. Did you know loneliness is as bad for your health as smoking multiple cigarettes a day? Music opens up avenues of communication that otherwise may not be available. Research has demonstrated that listening to music on a regular basis can enhance communication for seniors living with dementia by improving cognition and language abilities. The Music Wellness groups at the Village are helping to heal survivors of violence, crime or abuse while also providing opportunities to socialize with other residents, make connections, and develop friendships. The Music Therapist leads each group, using music, in discussions regarding life events, current events and residents’ memories. Residents have made comments such as, “I get up early on Wednesday so I make it to music,” and “I learn new things when I come here,” as well as “I came today to learn about music.” Residents who tend to sit in the same spot in the group room now sit with their peer. The spot is not as important, but the people are – that is the TRANSFORMATION. Music therapy can increase brain chemicals that arouse positive feelings in aged adults diagnosed with dementia. The Music Wellness group at our Senior Outreach & Adult Day Services provides the opportunity to encourage memories to arise. The Music Therapist provides sessions using music and visual stimulation to discuss the musical contributions of artists from the 1930’s-1980. The therapist uses live and recorded music to share with program participants the musical contributions of that specific musician. Using a computer that is linked to the TV, the therapist can share videos of live performances and pictures of musicians and their lives. When the session concludes, participants socialize with each other about the subject discussed in group. Often one hears reminiscing comments such as “I remember seeing him on TV” and “I danced to that in high school.” Participants with a dementia diagnosis are able to sing along to the songs used in the session, even if maybe they cannot recall what they ate for lunch. Singing the same song at the same time as others promote a shared sense of reality in addition to the shared memories. Music can be highly motivating during any type of exercise, including walking, dancing, stretching and working out with weights. The right music plays an important role in encouraging seniors to get more physically activity, which can help maintain independence and restore function lost due to injuries or illnesses. Every program the Music Therapist holds at the Village encourages wellness. 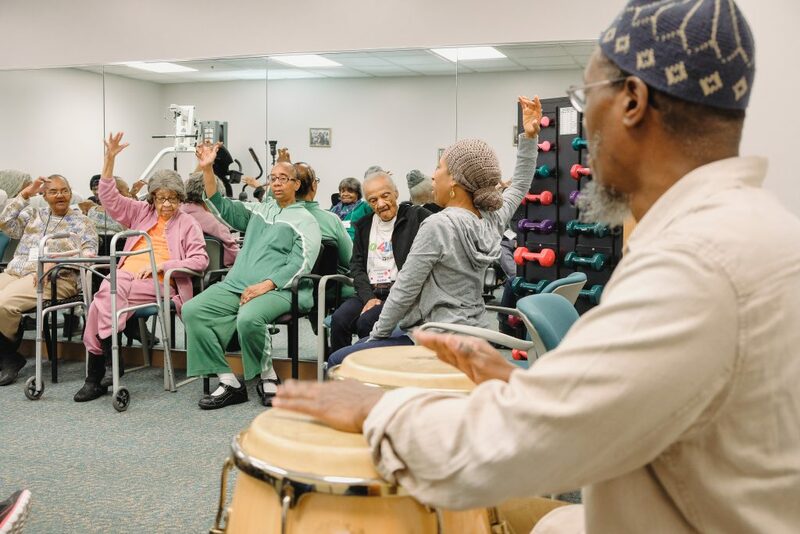 During the GPS Music Therapy groups, targeting ways to help heal trauma from abuse, violence or crime seniors may have experienced during their lifetime, the therapist often encourages movement and dancing to “wake-up” for the day. 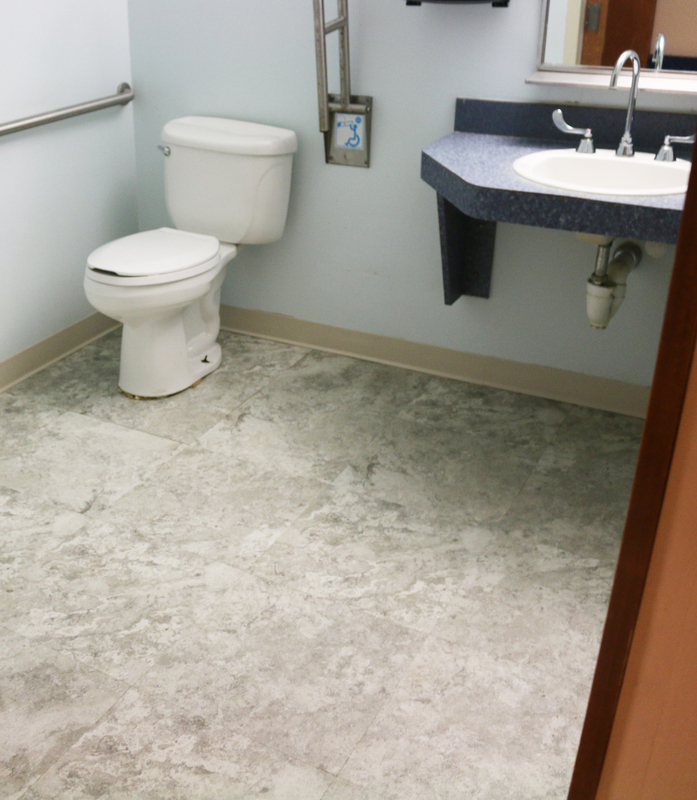 Residents often move and encourage others to participate. Participants in the Music & Memory program frequently dance when listening to their music. Many participants listen to their music while they eat lunch. It has been recognized by the nurses that participants seem to eat more of their meal when listening to their preferred music than when music is not present. This occurrence promotes wellness because the resident is then eating a full meal and receiving the nutrients they need. Additionally, residents who may be recovering from a stroke may participate in individualized neurologic music therapy techniques to assist in achieving a more normalized or fluent gait, increase use of the affected extremities in playing musical instruments, or redevelop the ability to communicate. For many aging adults, music provides benefits, including lessening of pain and discomfort without the use of medicines, improved ability to remember recent events, positive changes in mood and an increased sense of self-sufficiency. Happiness can be seen in all the different music programs that are offered at EBV. Even in the VOCA Trauma groups, when uncomfortable subjects like suicide, death, or trauma are brought up, residents have communicated they feel better now that they have talked about it/them. When songs are used for discussions, even unpleasant or distressing discussions, residents are happy to have heard a song and enjoy singing along. One can also observe happiness in the participants of the Music & Memory program when they are dancing to their music. Often you will hear them singing to the song that they are listening to. If you’re experiencing new symptoms of memory loss, hearing loss or changes in your vision, you may be feeling increased stress or anxiety. Engaging in music and art therapies can help relieve these feelings, improve your mood and impact your overall quality of life. Music & Memory program participants may receive their music during or prior to medical procedures, events which can lead to them feeling anxious. 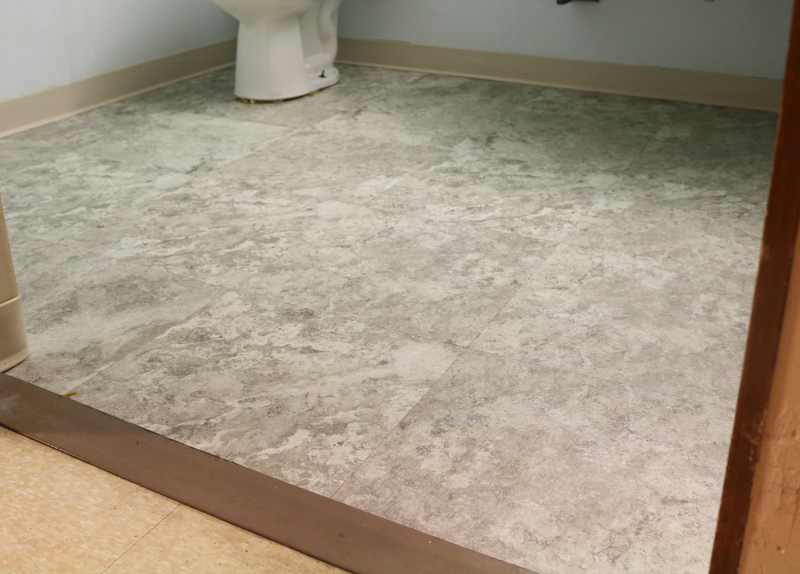 At EBV we had a specific participant who needed dialysis treatments three times a week. 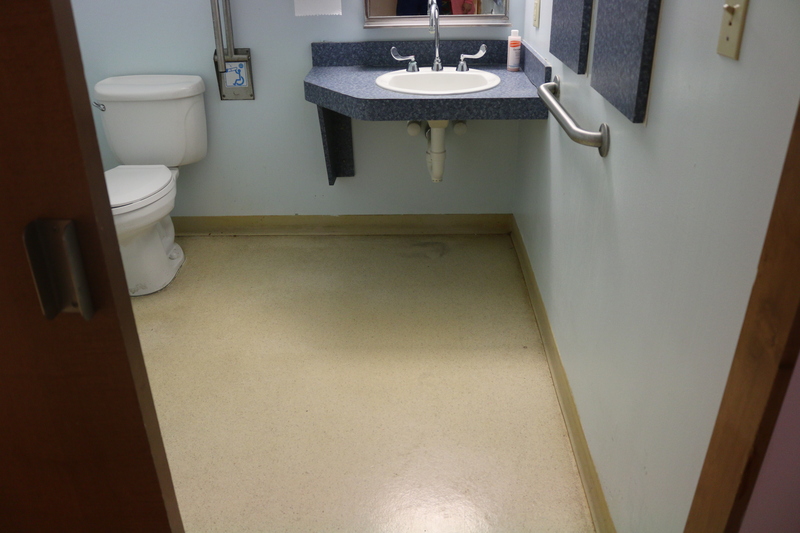 Before her music was provided, this individual received additional medicine to assist with the anxiety and restlessness she felt before dialysis. 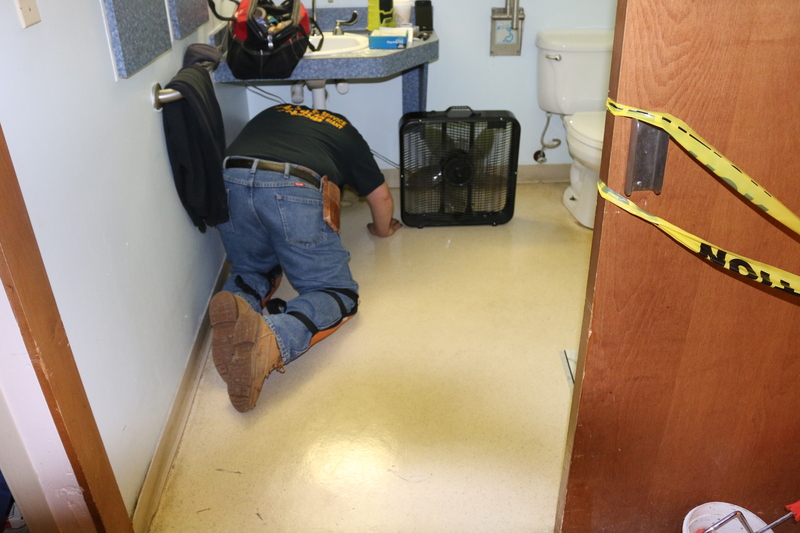 And during the treatment, the participant had to be restrained so as not to pull out wires or cause harm to themselves or others. 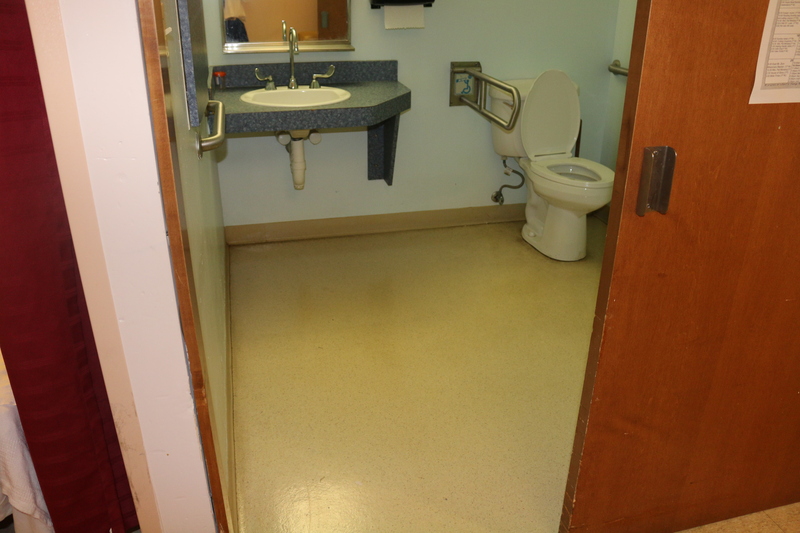 However, once the participant began to receive and listen to their customized playlist, all additional medicines were removed from their chart and the person did not need to be restrained during treatment. The music allowed the participant to feel more at peace during the treatment rather than feeling that constant anxiety. Other examples of music therapy and wellness providing peace to seniors may include the provision of music therapy services to those in hospice care. In this setting music therapy may help control symptoms, improve quality of life, decrease emotional distress/anxiety or alleviate pain, increase physical comfort and/or relaxation, stimulate cognitive or motor function, increase a sense of spiritual support and more. Because of your continued support in us, and our commitment to fulfill the mission of our visionary founder Eliza Simmons Bryant “to provide quality services, outreach programs and a dignified, compassionate and secure living environment for seniors” we have loved and cared for aging adults in our community for 122 years. That legacy is built on a strong foundation of hard work, dedication to serving our most vulnerable seniors, and steadfast passion for our residents, program participants and tenants and most importantly, you, our friends, donors and supporters.